In his Partnership Letters Warren Buffett discusses four different investment methods used by him in order to best act in accordance with his investment principles. The methods are: (1) Generals-Private Owner, (2) Generals-Relatively Undervalued, (3) Workouts, and (4) Controls. In Buffett’s Ground Rules, written by Jeremy Miller, the author provides the following checklist as a tool for evaluating a potential investment in a General, i.e., both Generals-Private Owner and Generals-Relatively Undervalued. Here is a checklist for evaluating a potential investment in a General: (1) Orient: What tools or special knowledge is required to understand the situation? Do I have them? (2) Analyze: What are the economics inherent to the business and the industry? How do they relate to my long-term expectations for earnings and cash flows? (3) Invert: What are the likely ways I’ll be wrong? If I’m wrong, how much can I lose? (4) What is the current intrinsic value of the business? How fast is it growing or shrinking? And finally, (5) Compare: does the discount to intrinsic value, properly weighted for both the downside risk and upside reward, compare favorably to all the other options available to me? 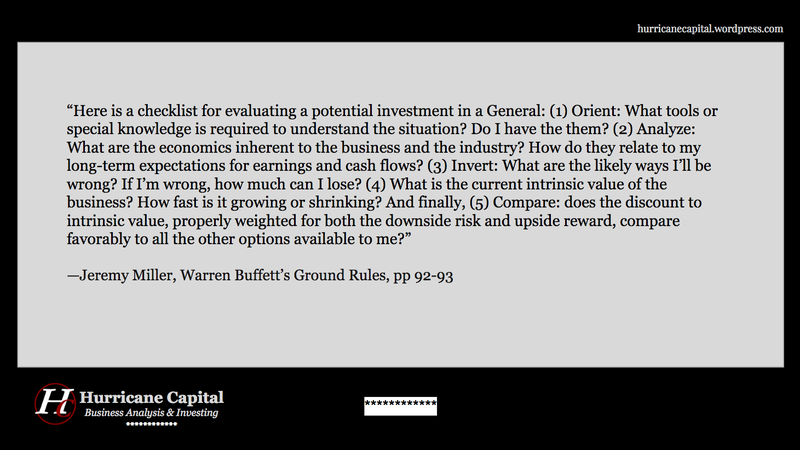 I enjoy reading Buffett’s Ground Rules, and one third into it I can highly recommend it. In this book the author provides a compilation of the old Buffett Partnership letters, and discusses different investment principles, methods, and digs into some of the investments made by Buffett during the 1956-1969 era. The author then goes on to provide some insight about what to do when you’re not able to clear each paragraph in the checklist. If you find yourself unable to make it all the way through the checklist, then write down in a single paragraph the metrics of the investment. If you get caught up along the way, either do more work or simply forget the idea as “too hard” and move on to something else.